An estimated 600 eager high school students flocked the UW Seattle campus for the annual Washington Journalism Education Association’s (WJEA) Journalism Day on September 19. 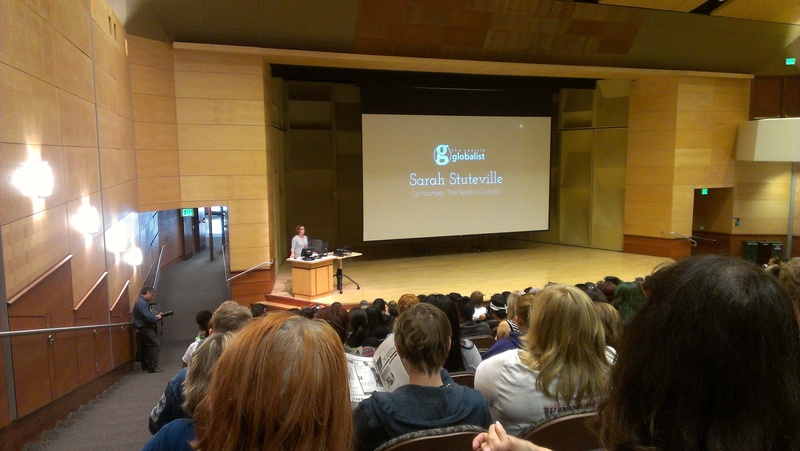 Hosted by the UW Department of Communication, students chose three sessions to attend from a range of topics and listened to a keynote speaker – our own Sarah Stuteville, Artist in Residence and co-founder of the Seattle Globalist, who also contributes regularly to the Seattle Times. “What would you do if you could do anything?” Stuteville said during her speech – a question she was asked by her friend (and now colleague) Jessica Partnow after college graduation seven years ago when they were left to grapple with a passion for global journalism during the ‘journalism crisis’. This question also anchored her presentation, as 600 curious students with a love for journalism stared back at her wondering what their next steps will be. One of the session leaders was communication alumnus Mike Baker (B.A., 2005), who is now an Associated Press reporter in Seattle, whose projects often include data-driven investigative stories. He is an expert at public records requests to create stories about state and federal government. We have been hosting Journalism Day for more than two decades and are excited to continue the tradition for years to come.